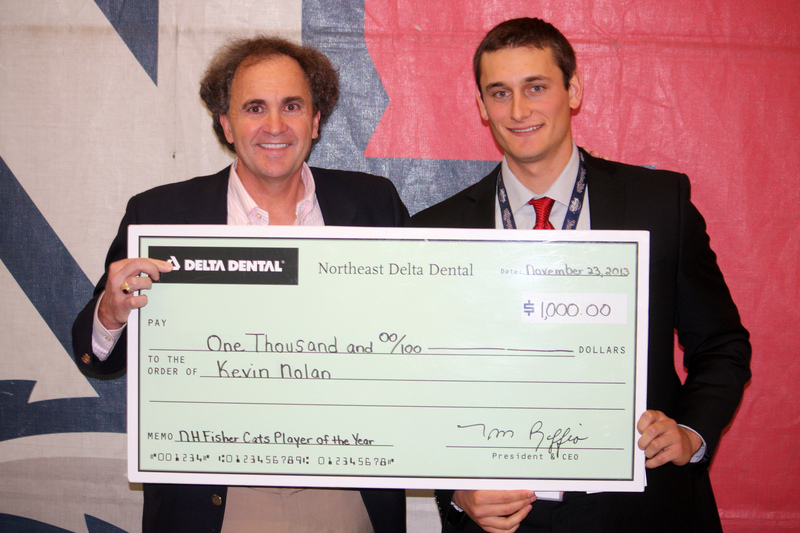 Northeast Delta Dental was the presenting sponsor of the Granite State Baseball Dinner on November 23. More than 1,000 people attended and raised more than $150,000 to support the Children’s Hospital at Dartmouth, the Ted Williams Museum, and the Fisher Cats Foundation. Since 2007, this brings the total to over $1 million. Among the guest list were current and former minor and major-league baseball stars including New Hampshire native and past St. Louis Cardinals pitcher, Chris Carpenter, Boston Red Sox outfielder, Jonny Gomes, and Tampa Bay Rays pitcher, Alex Cobb. At the event, NH Fisher Cats shortstop, Kevin Nolan, received the Fisher Cats Player of the Year award and the coveted “golden crown” trophy. Nolan is originally of Nashua and the first New Hampshire native to play for the Fisher Cats in 2013. This entry was posted in Baseball and tagged Granite State Baseball Dinner, new hampshire fisher cats, Northeast Delta Dental. Bookmark the permalink. The biggest star there was you Tom Raffio. You sure know how to show your athletic ability with your benevolent “arm”. Congratulations on another success! Thank you for your kind and generous comment! Happy Holidays.